Phnom Penh drone ban: Cambodia cracks down after journalist films queen mother. How to travel with a drone without causing an international incident. Sunset on Boeung Kak in Cambodia, as photographed from a drone operated by the author. It’s the newest travel trend: carting around a portable, camera-bearing drone while on the road. Suitable for selfies, dramatic landscape photos, and other eminently Instagram-able content, backpack-size drones equipped with action cameras are an increasingly common component of vacationers’ luggage. Cool as those YouTube videos of golden temples and snowy mountains may be, drone travel is a practice that can have outsize consequences if things go wrong. German visitor and video journalist Michael Altenhenne found that out the hard way on Feb. 14, when he flew his DJI Phantom 2 drone close to the strictly guarded Royal Palace in the Cambodian capital of Phnom Penh—apparently disturbing Queen Mother Norodom Monineath Sihanouk, who reportedly was doing her evening exercises behind the palace’s gold-painted walls. After the queen mother raised the alarm, according to local reports, Altenhenne was apprehended by authorities and his drone confiscated. 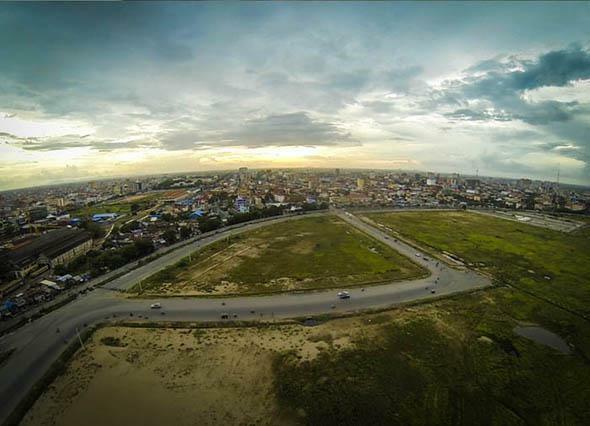 Annoyed city officials decided by Feb. 16 that drones would henceforth be banned within the Phnom Penh city limits. Only drone flights preapproved by City Hall authorities will be permitted. It’s not clear what the turn-around time for that approval would be, and there’s no indication what criteria will be used to evaluate applications. Phnom Penh municipal spokesman Long Dimanche denied that the new ban was solely due to the evening disturbance of the queen mother, telling the Cambodia Daily newspaper that the ban would help to protect privacy and to prevent the usage of drones by terrorists. Perhaps, but considering that drones had gone completely unregulated in Cambodia up until the incident, Altenhenne’s ill-fated flight provided a good excuse for authorities to act. Even Dimanche admitted that the incident with the queen mother was “one reason” the ban was implemented. It’s not as bad as it could have been. The authoritarian Cambodian government has little love for journalism and humanitarian investigations, and could have easily banned drones across the entire country, as was recently done in increasingly dictatorial Thailand. Drones can still be sold and purchased in Phnom Penh, and drone usage in Cambodia outside of the capital remains legal for now. But the ban inside Cambodia’s largest and most politically important city is still a major blow for many, including journalists, human rights monitors, filmmakers, and others dependent on drone technology for their work. In 2013, for example, controversial elections in Cambodia brought thousands of people into the streets in support of the opposition Cambodia National Rescue Party. At the time, journalists and human rights organizations lacked an effective way to conduct head counts of the protesters—a figure that would have been a good way to accurately gauge the scale of the backlash against the ruling Cambodian People’s Party. A drone flyover coupled with a bit of mathematics would have been an easy way to figure this out. But head count by drone won’t happen with the next major protest, either: It’s now almost certain journalists won’t be able to use drones to document political activity in Phnom Penh, as the odds of City Hall permitting this purpose seem rather slim indeed. Filmmakers, those with small drone businesses, and members of the nascent local maker movement will find their work hampered. Documentary filmmaker Christopher Rompré has resigned himself to finding tall buildings to complete his study of the architecture of Phnom Penh. Meanwhile, journalists and human rights representatives have expressed their own discomfort with the regulations. And the unpleasant situation can be blamed, at least in part, on the mistake of a single German visitor. Altenhenne’s behavior should serve as a warning to ethical travelers everywhere thinking of bringing their drone on walkabout—because the repercussions of a single mistake, even an innocent one, can extend to everyone. His regret is welcome, but it’s also not enough. As Altenhenne discovered, a foreigner behaving irresponsibly with a drone can find his actions causing unintended consequences for local people, including journalists, photographers, and small businesses that use drone technology to break stories and to make a living. It’s an unfair dynamic: While the visitor (as Altenhenne did) can grumble about a “violation of freedom of expression” and then go home, local people are left to deal with the political fallout. Travelers who care about freedom of speech and the welfare of their local hosts should keep this reality in mind before they decide to fly their drone over unknown territory. There’s also simple self-preservation. Altenhenne was detained and interrogated for six hours, and then was freed by police without charges, after which he flew to Thailand. But it’s easy to imagine much harsher consequences for errant drone vacationers, from big fines to prison time. * Due to the novelty of the technology, many nations have no drone regulations at all and interpret these matters on a case-by-case basis—meaning that it’s hard to predict what might happen if your drone malfunctions, or if you fly over the wrong location. Take it from me: I’ve flown my own drone many times in Cambodia and Thailand, and I’ve enjoyed sharing, with the Internet and with my friends, the cool photographs I was able to take. But I’ve also made an effort to fly during times of day that are relatively quiet and in places that aren’t too crowded, secure prior permission when I can, and work with local friends and contacts to ensure I’m not flying over something especially politically precarious. The good news is that what I’ve decided to dub Leave No Trace drone travel is perfectly possible, as long as drone-loving tourists are willing to do some homework. Reach out to local drone pilots in the country that you plan to visit. It’s easy to find these people via Facebook, Twitter, and the DIY Drones community. They will be the best authorities on what’s legal and what isn’t, and you’ll likely make some new flying friends in the process. When you do go to fly, don’t go alone: If at all possible, bring a local friend or contact, who can speak the language, interpret the situation, and interact with authorities if you draw unwanted attention. It’s hard to explain yourself while you’re trying to land a drone. Most importantly, be polite and be compliant: The cool drone video you’re shooting is probably not worth deportation or a jail sentence. If you are told to bring the drone down, don’t argue: Just do it. Shooting drone footage overseas is incredibly fun and a great way to document travel experiences from an unexplored new perspective. But remember that your mistake may cause serious consequences for your drone-flying counterparts in the country you’re visiting. Be cautious, do some local research first, and be respectful to local authorities. And whatever you do, try to avoid shooting photos of elderly queen mothers.